It was windy and quite chilly for this time of the year at ~8700 feet – Sarah borrowed my heavier coat and I hiked in a long shirt and polartec vest, which wasn’t warm enough. 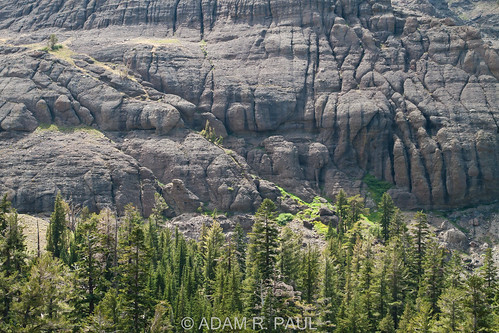 The hike to Nobel Lake is vertically V-shaped, and we descended gently, enjoying views of the craggy cliffs to the west and opening views out toward Markleeville to the east, as we descended out of the forest into more open terrain. 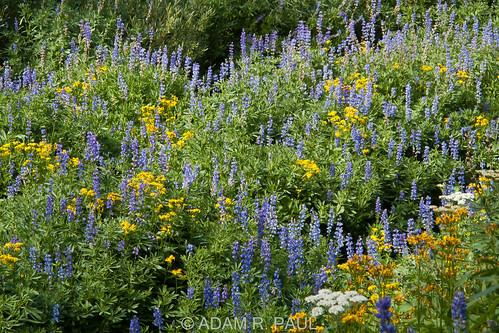 I’d thought we would be late for much in the way of wildflowers, but this was not the case, as many open areas were blanketed in lupine and asters. 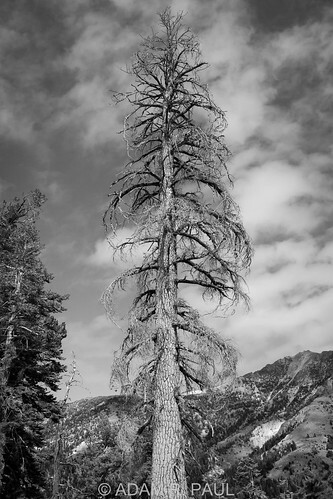 The Mule’s Ears, which along with Lupine and Paintbrush, form the “Sierra Tinity” of spring bloom were long gone, with only their fuzzy dusty leaves remaining. 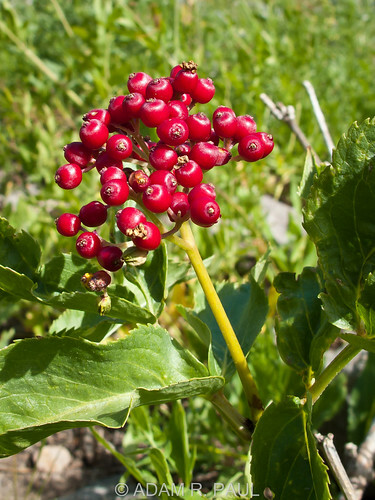 And of course not all foliage of interest needs to be a flower – Red Elderberry, striking in its flaming color, was abundant in several seepages on the hillside. A couple of icy blasts of wind brought little white specks from the sky. Ashes from a nearby wildfire? No – snow flurries! Very strange in August, and under mostly clear skies no less. 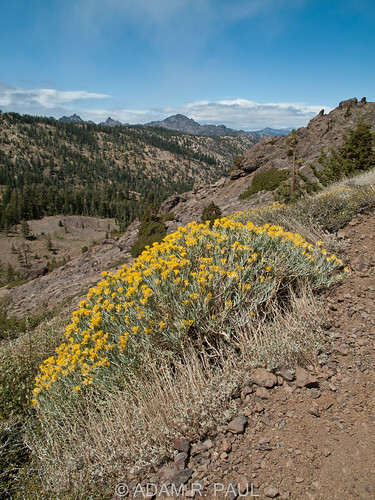 The terrain on the initial downward hike alternates between dry and rocky and, where the PCT crosses a half-dozen or so permanent and semi-permanent seepages and creeks, lush and verdant. 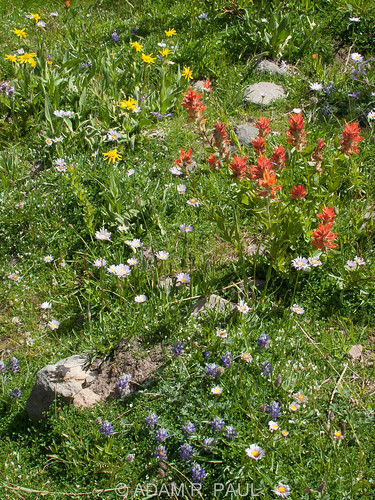 Most of the wildflowers we saw were in these drainages, for obvious reasons. 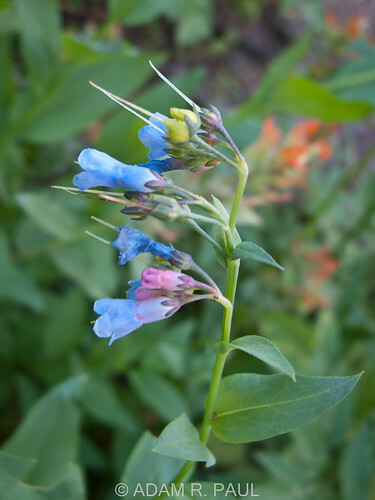 One of these flowers was new to me – Elica correctly pegged it as a Bluebell, and a little digging in a wildflower book back home confirmed that it is indeed Streamside Bluebells. We continued downward, feeling fine, since when hiking gently downhill, the altitude doesn’t really have much effect (we were at home at 0 feet the day before, not exactly acclimated yet!). 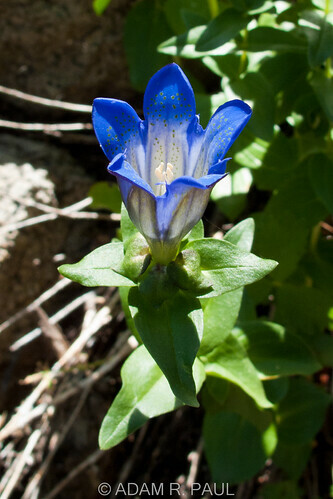 A patch of bright blue by the trail caught my eye – Explorer’s Gentian, one of the prettier High Sierra wildflowers, and one that I do not see very often. 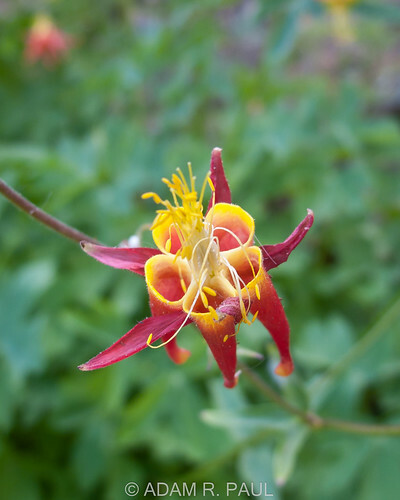 … and a patch of Crimson Columbine, another of my favorite wildflowers. More freezing blasts and light snow flurries kept us on our toes, and I felt bad for the several through hikers we’d encountered, all of whom were heading south. 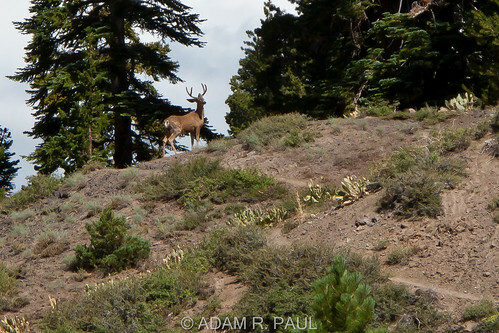 A pair of young bucks with new-looking antlers crossed the trail ahead of us, and just in front of a backpacker, then bounded off into the woods. I’d have had a fine photo if I had a telephoto with me, but the 150mm max extension on my G10 did alright, albeit with quite a bit of cropping. 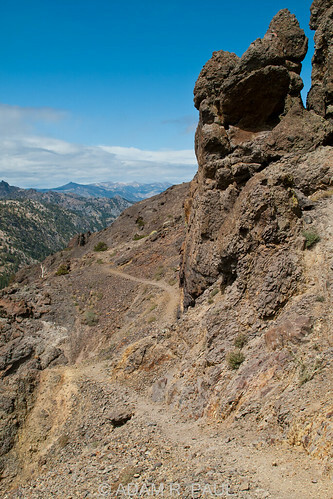 We eventually came to the junction with the Noble Canyon Trail, which is a little bit longer, but a much steadier grade. 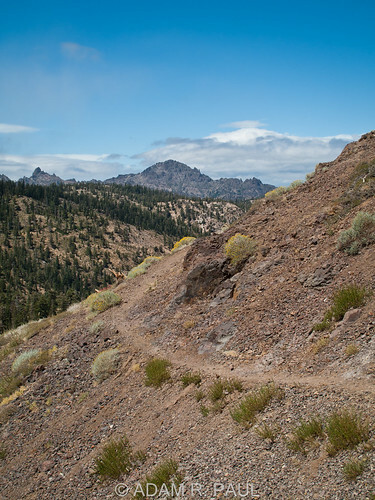 I hiked in on this trail years ago when I climbed Highland Peak and was grateful for its gentle descent on the way out, as opposed to the PCT’s climb out, but on this day hike it’s no matter, and the PCT is much more scenic. After crossing a couple more streamlets the trail switchbacked up toward Nobel Lake on rather moonscape’y terrain. Views opened up, which was a good thing, as now that we were climbing, we most definitely noticed the altitude! 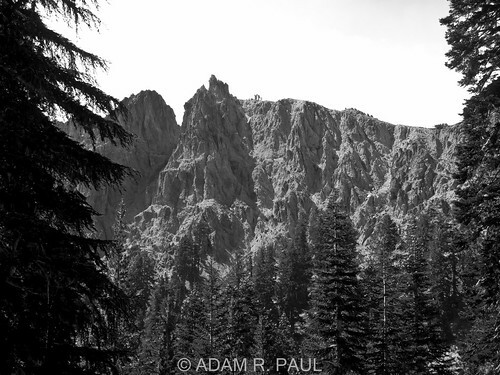 Nearby Raymond Peak (reachable by hiking north on the PCT from the same trailhead as we started at) dominated the skyline, with its craggy, broken jumble of a summit. 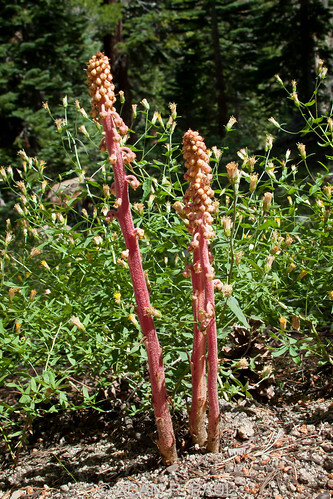 Other than Rubber Rabbit Brush, Mountain Monardella, and a few others, few flowers favored this part of the trail. After what seemed like entirely too long for a relatively short hike, we eventually reached Nobel Lake at 1:43, our turnaround point for this walk. Although a convenient turning-around point, Nobel Lake itself is not particularly attractive, being high and windswept, so we didn’t linger, and set back down the trail to find a nicer lunch spot. 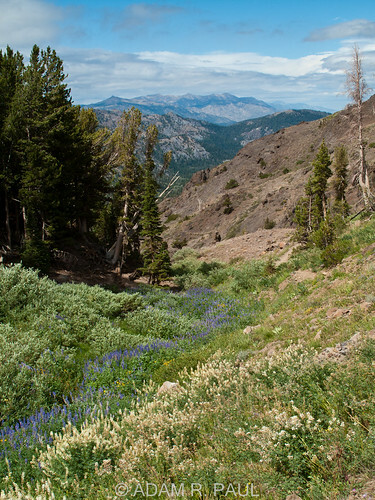 Nobel Lake’s outlet stream had a river of lupine, both purple and white, flowing downstream, making for a pretty view. 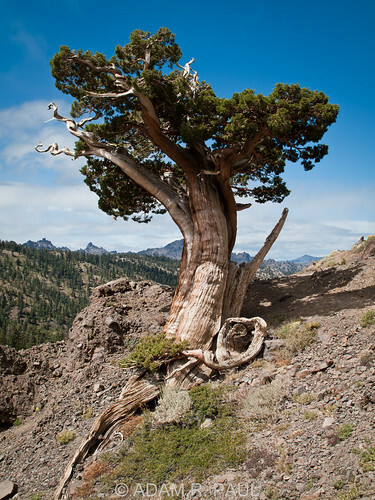 It’s always interesting on out-and-back hikes the different things one sees on the return trip. 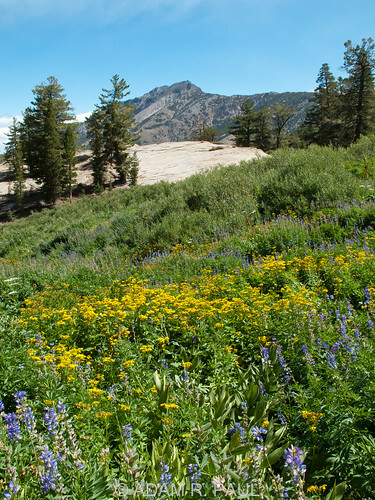 I had completely missed this lovely patch of Alpine Aster, Paintbrush, Miniature Lupine, and a yellow aster on the hike in. The arid otherworldly part of the trail was much more pleasant going down than coming up, although icy blasts of wind made us a little nervous on the narrower and more exposed portions of the trail. We didn’t dally much going down, as we were peckish and eager to stop and eat our sandwiches. Near the bottom of the hill we stopped at one of the more substantial bubbling streams and ate and rested for a few. From here it was unfortunately all uphill back to the trailhead, and we found the going slow, as I have on the other 3 occasions I’ve hiked this trail. Several of the creek crossings had very tall Larkspur blooming abundantly. 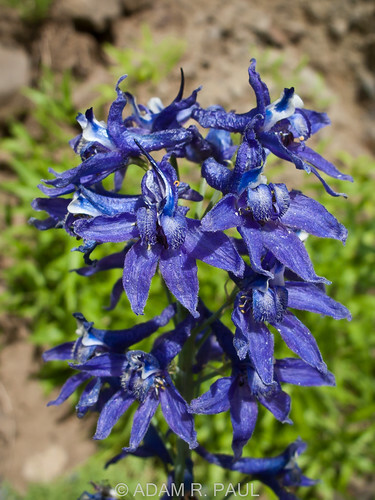 I normally have a hard time identifying larkspur to a species, but this one proved easy enough – it’s Tall Mountain Larkspur, fittingly. 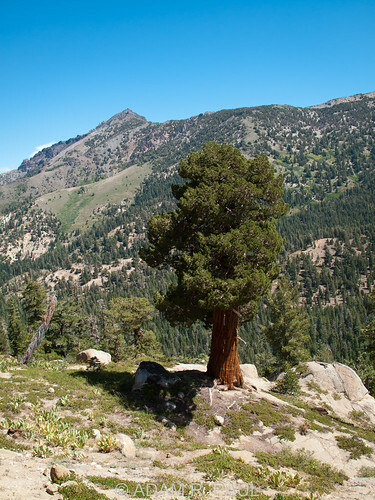 The views continued to be very nice, and once we re-entered the forest the winds subsided and we weren’t so chilly. Somewhat threatening-looking clouds were building, but the skies immediately above us remained mostly clear. As it had been nearly 5 hours since we’d hiked out, the lighting was different and at a more pleasing angle than at midday. 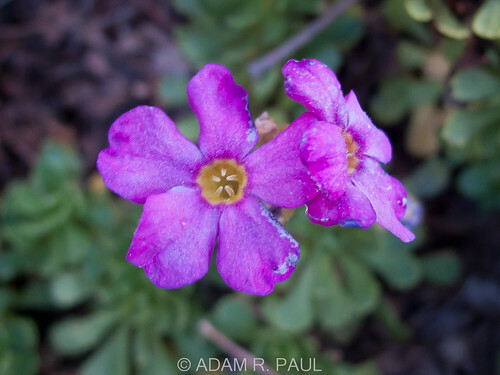 Not far from the trailhead, I saw another flower that I’d somehow missed on our way to the lake – the not-at-all-subtle Sierra Primrose. At 4:14 we arrived back at the car, whose thermometer said it was 46F out – no wonder we’d felt cold! This is one of those hikes that always seems nicer in retrospect. 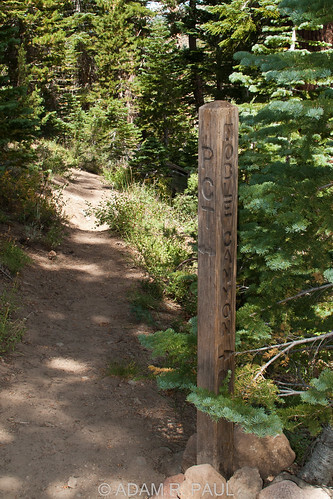 The scenery is wonderful, but the uphill hike back to the trailhead is a bit of a drag, and always seems to take much longer than it should. 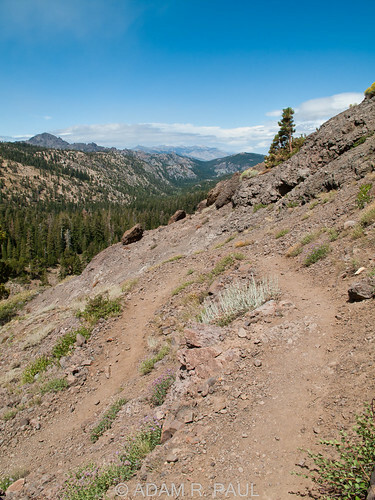 Still this is one of my favorite day hikes in the Carson-Iceberg Wilderness, and I’m sure I’ll do it many more times. 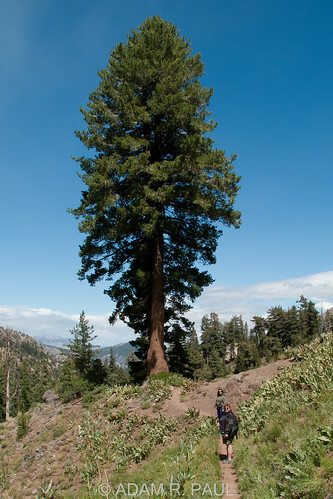 Hi Adam, I did this same hike in 2005 during the middle of the summer. I have some of the same photos you have posted. My hiking partner and I decided to climb to the top of the saddle and got a view of Highland lakes. 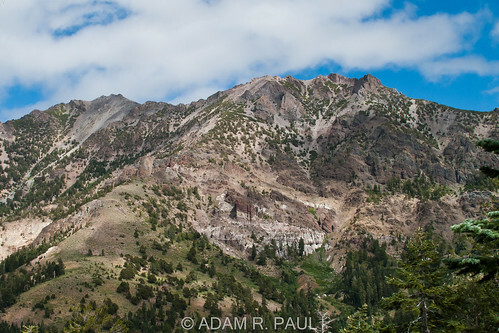 I’ve also hiked to Heiser Lake and to Peep Site Peak. My next adventure is to Bull Run Lake. Thanks for the posts. Hi Robert – thanks for commenting! 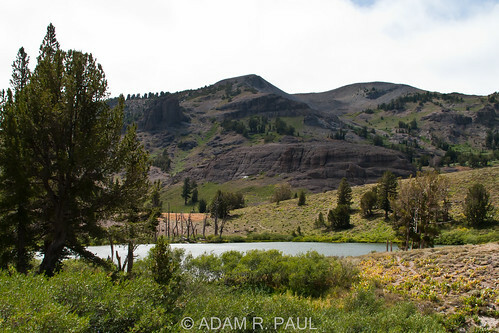 Bull Run Lake is a great hike – I’ve backpacked there twice. Don’t go too early in spring or the mosquitoes are horrible (the second time, we cut our stay short by 2 days & 1 night due to them)! 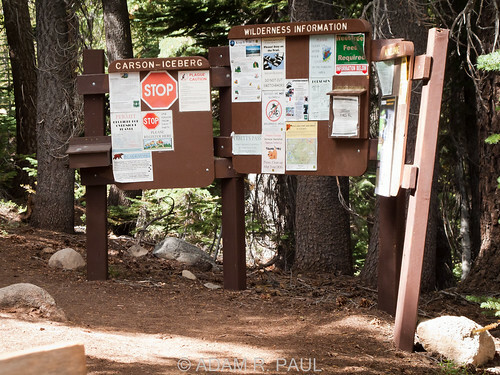 If you’re overnighting @ Bull Run Lake, it’s a fun off-trail dayhike to Bull Run Peak, which has nice views of Peep Sight and the inner Cason-Iceberg Wilderness. 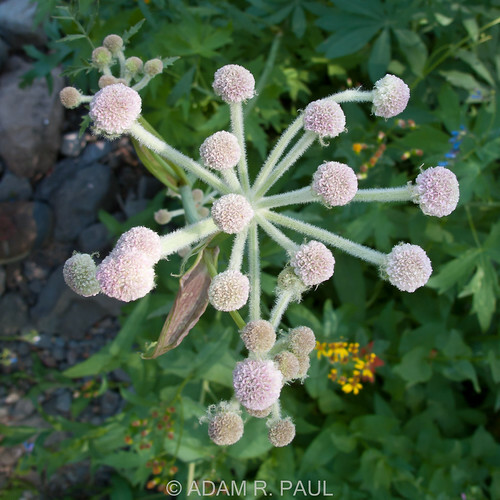 One of these days I’ll convert my posts & photos from those adventures to this blog…. Lovely shots! Those flowers look amazing! It must be wonderful being there. 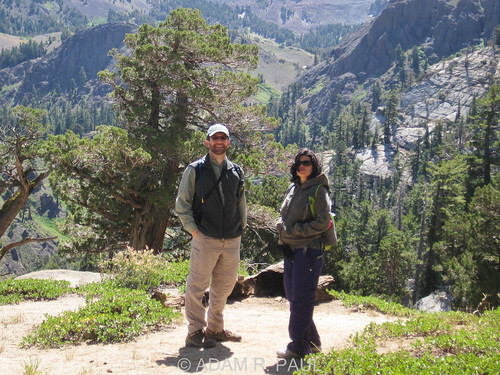 Thanks Ruby – it’s a wonderful dayhike!